Utah's elected leaders have long prided themselves on the state's supercharged economic engine. If Utah's economy were an automobile, it would be a drag-strip-worthy muscle car, running on free-market principles compared to the more eco-friendly engines of liberal coast economies. But new research released by the advocacy group Voices for Utah Children, in partnership with the University of Utah Department of Economics, shows that while Utah's economy is cruising full-throttle not everyone in the state is enjoying the ride. New rankings, as of Jan. 30, 2015, have Utah claiming the fourth lowest unemployment rate and third highest job-growth rate in the nation. While state leaders are busy patting themselves on the back over these numbers, the Voices for Utah Children's report titled "Utah Jobs: Quantity vs. Quality" released Feb. 6 paints a different economic picture for Utah. Utah may be bouncing back from the recession of 2008, but the bounce is better for the have-mores than it is for the have-less citizens. According to the report, occupations in the top 60 percent saw their median wages decline by about 1 to 1.5 percent. Folks in the bottom 40 percent, however, saw their median wages decline by 4 to 6 percent, with Utah's inequality growth outpacing the nation. The report even calls into question Utah's meteoric job growth, pointing out that the average wage of jobs gained between 2010 and 2014 was 22 percent less than the average wage of the jobs lost to the recession between 2008 and 2010. Utah's poverty rate also has not recovered fully from the gut punch of the 2008 recession. 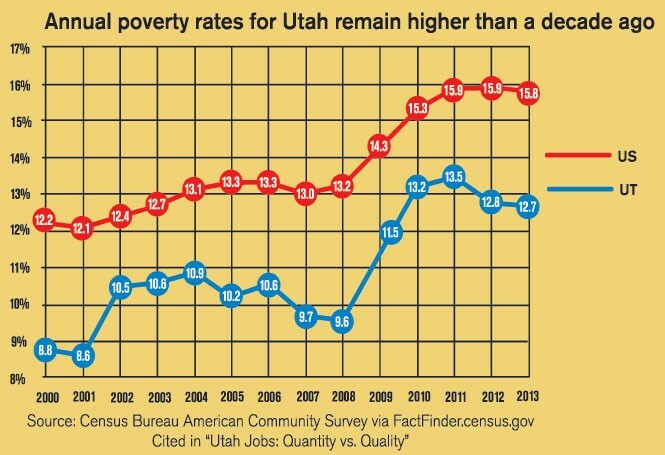 According to the report, as recently as 2013, Utah's poverty rate was 12.7 percent compared to the start of 2008 before the recession, when the poverty rate was at 9.6 percent. Matthew Weinstein, the priorities partnership director for Voices for Utah Children, notes that the study links Utah's explosive job growth to Utah's equally explosive population growth increases. Allowing for population, the report argues Utah's job growth is slightly behind that of the nation. Between 2011 and 2014, Utah saw 148,958 new jobs compared to 168,556 in new population, which shows an 88 percent ratio of jobs to population. Nationally, for the same period, there were roughly 8.7 million new jobs created compared to 9.5 million in new population growth, which equates to a ratio of 91 percent. "Utah's job growth has to boom in order to keep up because our population growth is one of the fastest in the nation," Weinstein says. His organization advocates for policies that help address poverty in Utah, but such progressive policies get little love from conservative lawmakers on Capitol Hill. Medicaid expansion could help close the gap by preventing low-incomepopulations from falling victim to medical bankruptcies. Gov. Gary Herbert has been pushing his Healthy Utah initiative that would expand Medicaid. His plan faces opposition from legislators who would rather offer coverage only for the medically frail, or only about 16,000 Utahns. By comparison, under Healthy Utah, more than 140,000 lower and middle-class Utahns would be covered. In Herbert's first press conference of 2015 addressing the Legislature, he cast the issue in a way that would be more palatable to conservatives by lamenting that the state is missing out on federal matching funds by not expanding Medicaid. "In Utah's case, we're going to be sending back [in federal income taxes] about $800 million a year," Herbert said. "Obama took it from us. I want it back; it's that simple." A bill that would raise the minimum wage could give a boost to low-income Utahns, but such bills are typically D.O.A. on the Hill. This year, Rep. Justin Miller, D-Salt Lake City, is focusing his efforts on House Bill 236 to raise the minimum wage for "tipped" employees such as restaurant servers from $2.13 up to the regular minimum wage of $7.25. Miller says 20,000 Utahns live on tipped minimum wages, two-thirds of whom are women. Miller says states that have raised the wage for tipped workers have reduced poverty rates by as much as 34 percent. By providing more wage stability with an increased minimum wage, Miller says tipped employees will be less likely to need multiple jobs and can avoid public assistance to get by. "If you work 40 hours a week, you shouldn't have to live in poverty," Miller says. "That's my philosophy." Melva Sine, head of the Utah Restaurant Association, has read Miller's bill language and challenges the need for increased costs to be passed onto consumers, especially since she says many tipped employees in the restaurant industry make well above minimum wage. She says the average tipped wage in casual-dining restaurants is $12 to $17 an hour, and in fine-dining restaurants, it can exceed $20 an hour. "The restaurant industry would have to increase the cost to consumers,and that's why the Utah Restaurant Association feels the legislation is not well thought out," Sine says. Miller says the research he's seen, however, would only result in a likely 4 percent increase for meals served. "If I have the luxury of going out to eat, I should be able to pay that extra 4 percent, especially knowing that that will allow the person busing my table or taking my order to get closer to a liveable wage," Miller says. Weinstein with Voices for Utah Children points out that policies that help lower-income Utahns help the economy as a whole, given that those just getting by are more likely to spend their extra green—not save or invest it—which in turn helps local businesses. "A lot of people think these [measures] either are taking from the rich to give to the poor, or taking from businesses to give to workers," Weinstein says. In fact, these measures help "grow the economy. If we have a dynamic where lower-economic Utahns get a boost to their families—that boosts the entire economy."